The musical Cats first hit the London stage in 1981, and has been a phenomenal success ever since. Composed by Andrew Lloyd-Webber, directed by Trevor Nunn, produced by Cameron Mackintosh and based on the poems of T.S. Eliot, its pedigree is superb. But for some obscure reason I have waited over thirty years to see it. Now touring again, the Grand Theatre in Leeds is hosting this iconic show, and so I end my long wait. Packed theatre, palpable excitement, and the show bursts open on an over-sized rubbish dump as ‘cats’ come leaping, crawling and running from every possible theatre orifice. There is a cacophony of sound, music and song, accompanied by gyrating dance in a variety of styles which cover just about every dance mode going. An explosive opening sequence which leaves the observer breathless. The cats introduce themselves and we hear T.S. Eliot’s chaotic and poetic names; Rum Tum Tugger, Old Deuteronomy, Skinbleshanks, Macavity and Mr Mistoffelees, along with others who all proudly announce themselves. 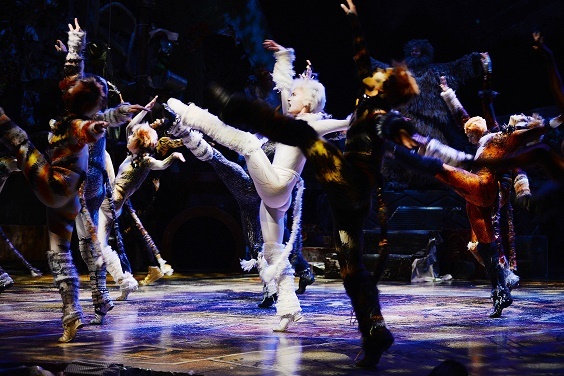 These are the Jellicle Cats attending their yearly Ball, and the dancing, athleticism, song and music go on – and on and on and on – for all of the one hour and fifteen minutes of Act One. The dancing is flawless, the music is compelling and innovative, and it is superb without doubt – but, my oh my, it is relentless. The only relief is the appearance of the bedraggled Grizabella, once the Glamour Cat, now old and rejected by the rest of the Jellicles after she left them for ‘better things’. Marianne Benedict is a wonderful Grizabella, and we can discern the tall and majestic Glamour Cat she once was. Act Two is somewhat toned down, which was very welcome, as the Jellicle cats contemplate their moments of happiness, and act out in song and dance the highlights of their lives. Lee Greenaway as Skimbleshanks, the Railway Cat, impressed with his friendly manner and obsession with riding the trains as he checked on every detail of their order. The villainous Macavity appears and kidnaps Old Deutronomy. The cats call in the Conjuring Cat, Mr Mistoffolees. He uses his magical powers to rescue him. There is a lot going on here, apart from the continual dancing. You need your wits to follow the plot, but it is also exciting as the cats move towards the event of their year, the choosing of one of them to journey to the Heaviside Layer to be reborn to a new life, perhaps one of their legendary nine lives. Grizabella crawls on stage again, her pain and sadness apparent. Marianne Benedict sings ‘Memories’ like never before. The words are emotive and it is easy to weep. Benedict’s delivery wrings every ounce of pathos from the song. Her crescendo towards the end is overwhelming. The audience was gripped, enthralled, then tumultuous in their appreciation. There was many a tear shed, mine included. The costumes are superb, with their abundant array of cats of every colour, shape and size. The over-sized set is a revelation of gigantic crisp packets, an old white shirt and all manner of recognisable rubbish. All this cleverly tones the size of the cats down. Cats is a genuine phenomenon. On paper it will never work. On stage, with the talented team that created it, and the sublime cast that bring it to life, it has become an extraordinary experience.